Definition - What does Prayer Squat mean? Prayer squat is a gentle yet effective posture that even beginning yogis can incorporate into their practice. It is thought to improve both balance and concentration. 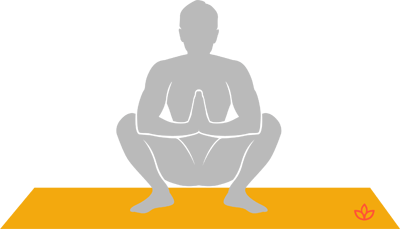 In this pose, the yogi begins in mountain pose with the feet further apart and the hands in prayer pose in front of the heart. The hips lower toward the floor into a squat. Then the elbows press into the creases of the knees. The pose is held for up to eight breaths. Yogis may wish to do multiple prayer squats as a challenging flow. Prayer squat is also known as namaskarasana in Sanskrit. Prayer squat stretches the hips, tones the upper leg muscles and assists in digestion. Prayer squat is known to be helpful for women preparing for birth and some believe it is effective in strengthening muscles to reduce incontinence. While in this pose, additional pressure from the elbows will help deepen the stretch. Also, if the heels are unable to rest on the floor, using a supportive blanket or widening the stance of the feet will assist yogis with proper positioning and support.